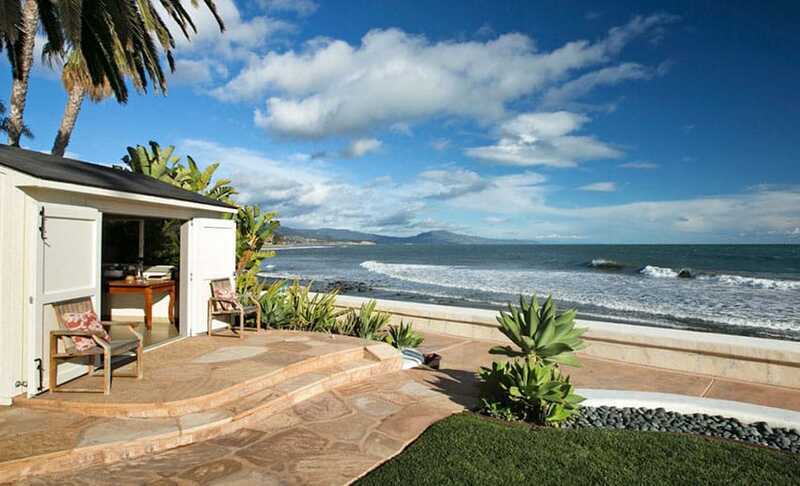 This luxury oceanfront cottage in Santa Barbara CA is small in size but makes up for it in location. The home sits on a .65 acre lot and actually has two homes, the main cottage and an even smaller guest house. The main cottage offers 2 bedrooms and 3 baths, a swimming pool and amazing oceanfront views with beach access. 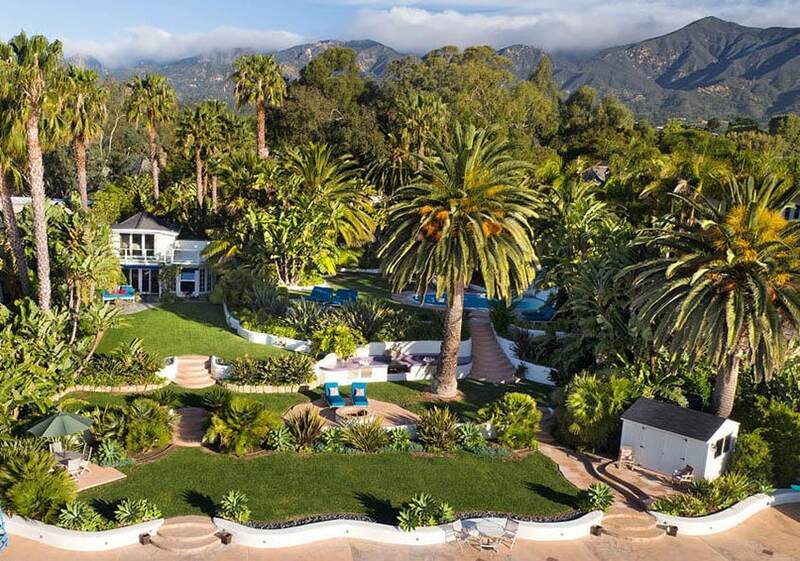 This single family home was built in 1929 and is located in Montecito, one of the wealthiest communities in the U.S.
From the picture above you can see a view of the grounds with beautifully landscaped yard, mature palm trees and plenty of room to enjoy the scenery. 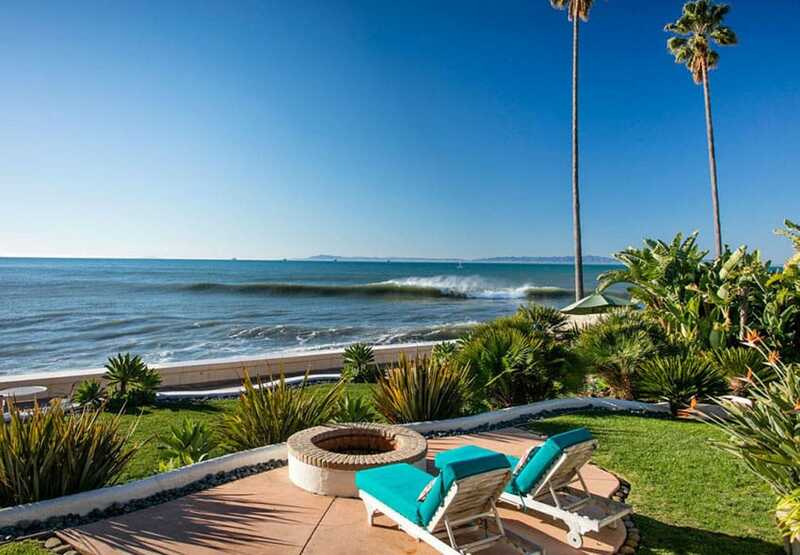 This home’s large oceanfront lot provides the ultimate vacation retreat or full time living beach bungalow. 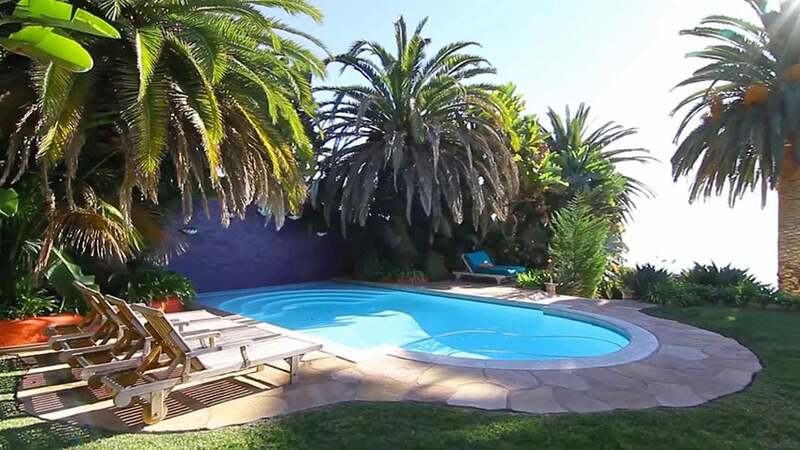 From the home one can hear the crashing waves take in the stunning ocean views and be steps away to the sandy beach. The living room of the cottage oozes vintage charm with its rustic stucco fireplace with custom shell design and slate bench. Light wood hardwood flooring, ceiling beams & skylights, and a stunning ocean view are some of the rooms highlights. 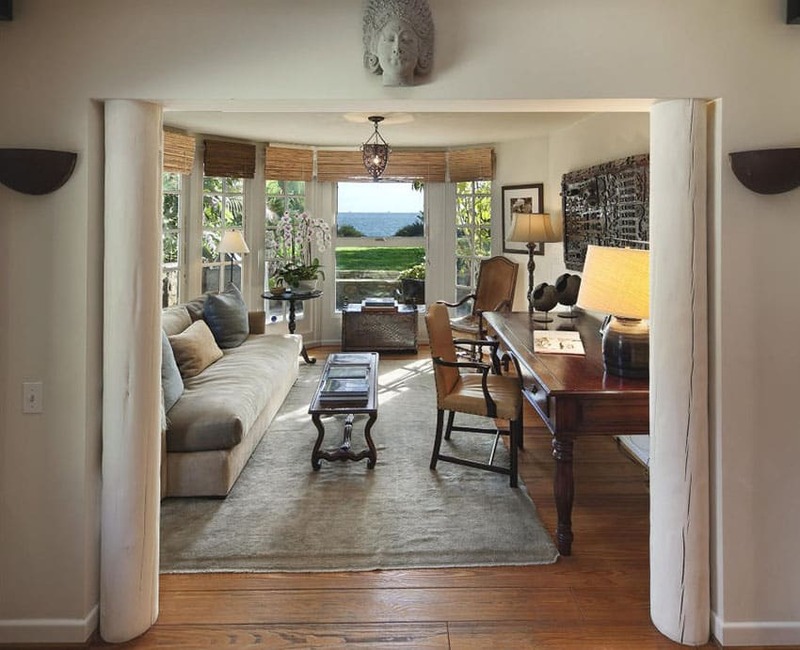 Through the living room is a small room setup as a study with expansive ocean views. Wood floors continue through this space and large double pained picture windows provide plenty of natural light and the ability to take advantage of the views. 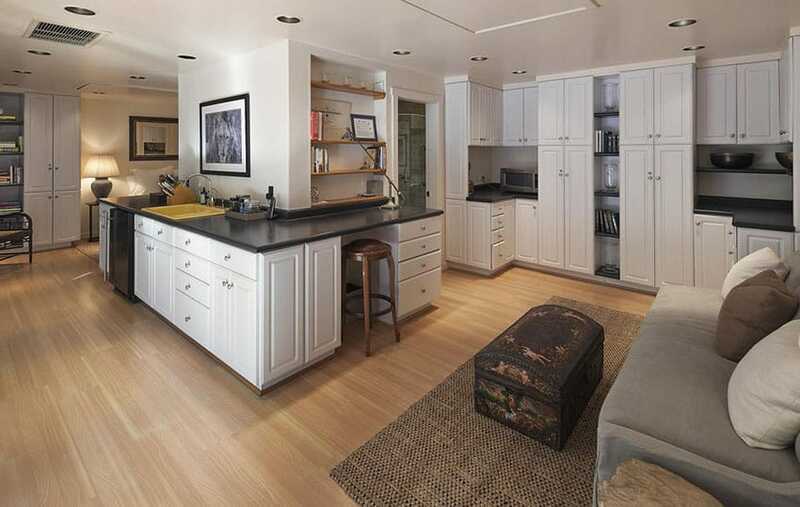 The open plan layout flows in to the kitchen area with two islands with tile counters and dark mahogany cabinets. The natural stone flooring of the kitchen provides contrast from the light wood flooring. The kitchen has a spectacular ocean view through a large sliding door that leads out to the back patio area. 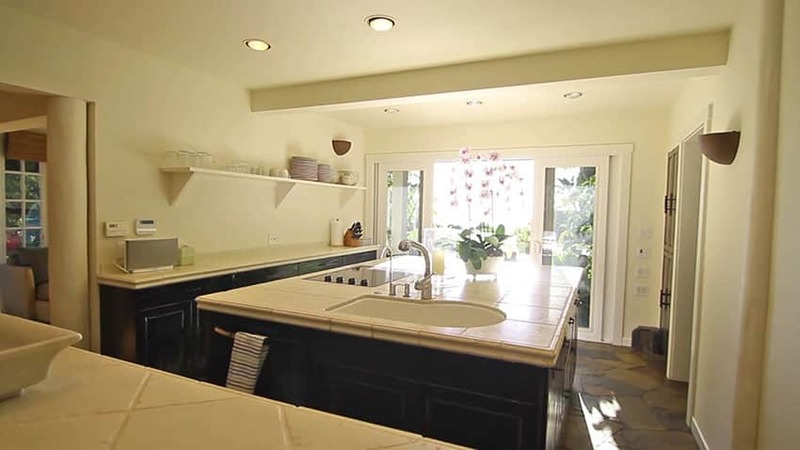 A closeup view of the kitchen with its dark cabinets, stone floors and white tile countertops. 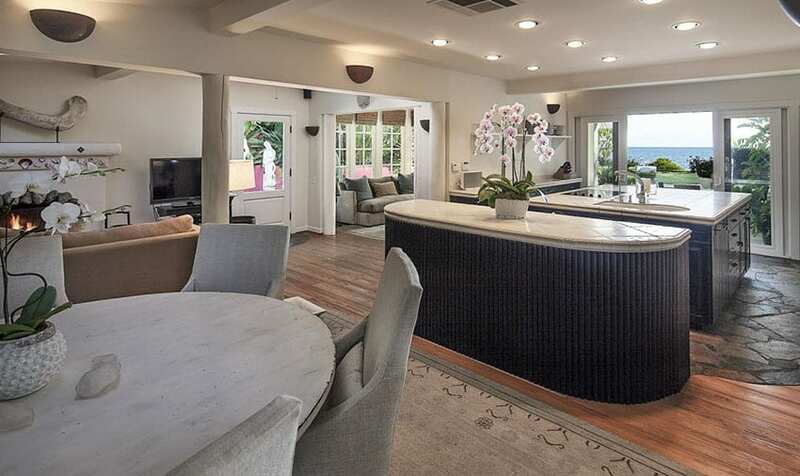 The home was constructed in 1929 and it shows in the home’s craftsmanship with its stuccoed walls, pillars and beams. Take in the stunning Pacific ocean views from the second floor master bedroom with attached balcony. A mirrored wall help open up the small space and increases the ocean panorama. The ultimate in relaxation is to wake up in the morning and see the ocean from your bed. 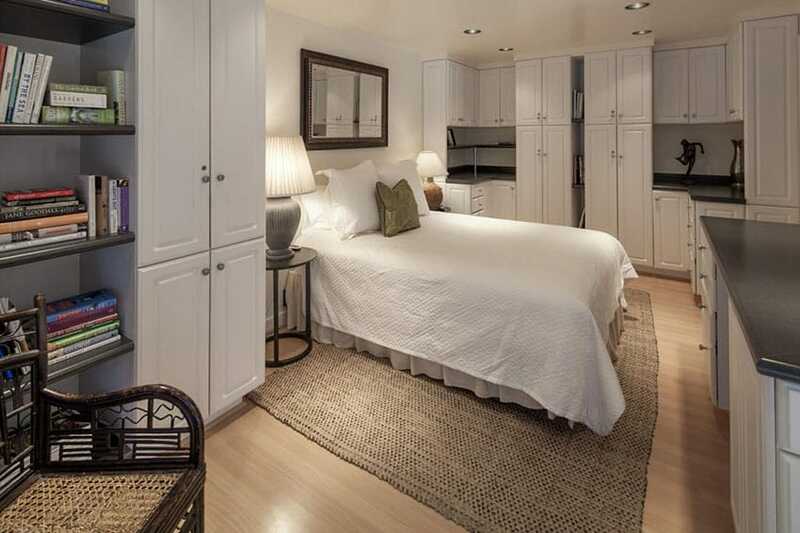 The second bedroom provides custom fitted cabinetry and wardrobes for plenty of storage space. Another vantage point with a view of additional cabinetry, black laminate countertops and small built-in sitting nook. 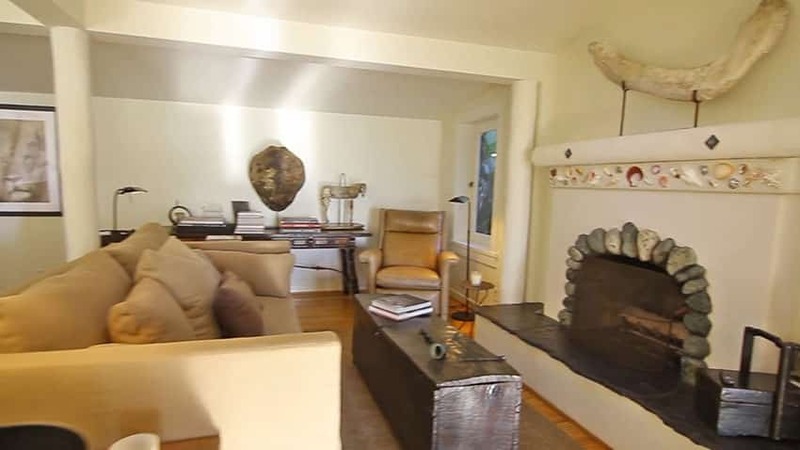 A reversed view of the main living room shows extra room for sitting and the details of the beamed ceiling. The view through the upstairs bedroom window of the balcony, backyard and ocean. The balcony has a glass railing to maximize water views. From the back porch of the house you can see a small stone patio area with room for outdoor furniture and potted plants. The outdoor furniture is furnished with bright blue cushions and red accent pillows bringing in some visual interest and contrast to the natural surroundings. 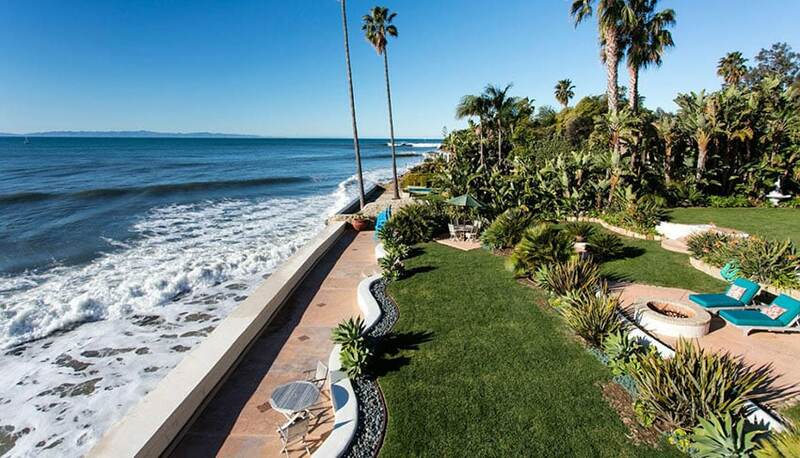 The home’s balcony offers sweeping ocean views of the Santa Barbara coastline. 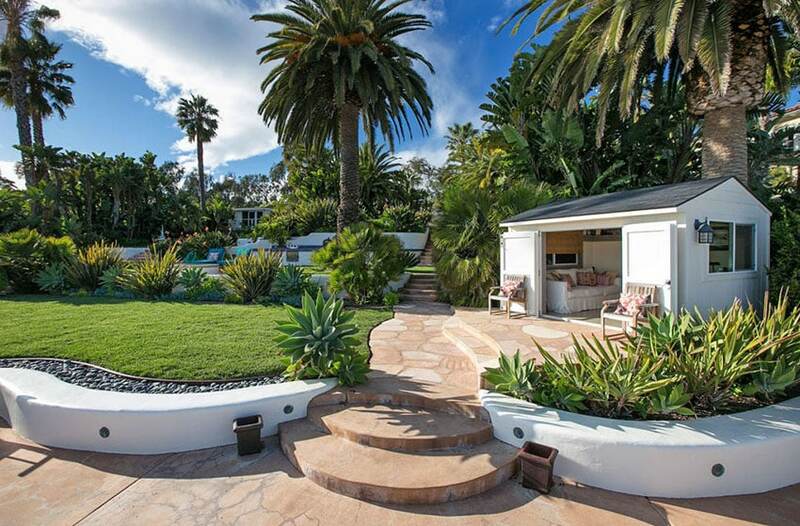 An expanded view of the home’s backyard shows the large landscaped lawn area with rustic retaining wall and mature palm trees. 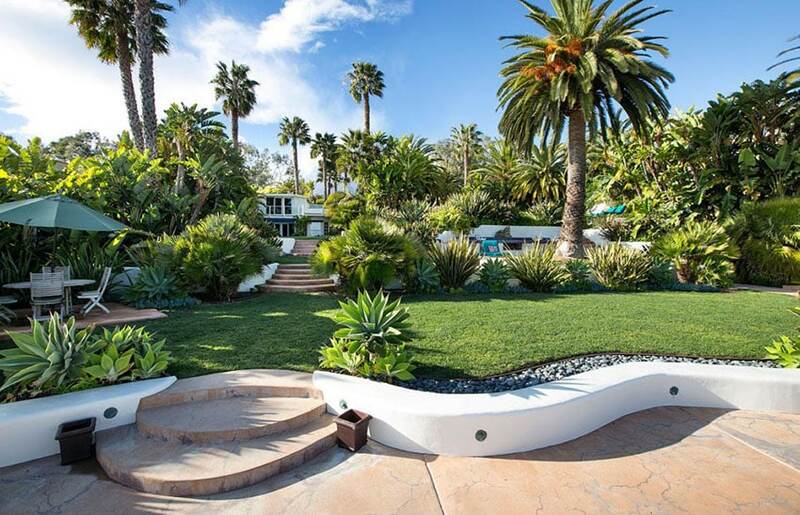 A large winding retaining wall separates the tropical plants from the lawn. A large stone fountain provides a luxurious backdrop tugged between tropical trees. A view of the oceanfront swimming pool and patio with gorgeous location on the beach. The pool’s patio provides room for lounge chairs to enjoy the sunshine. 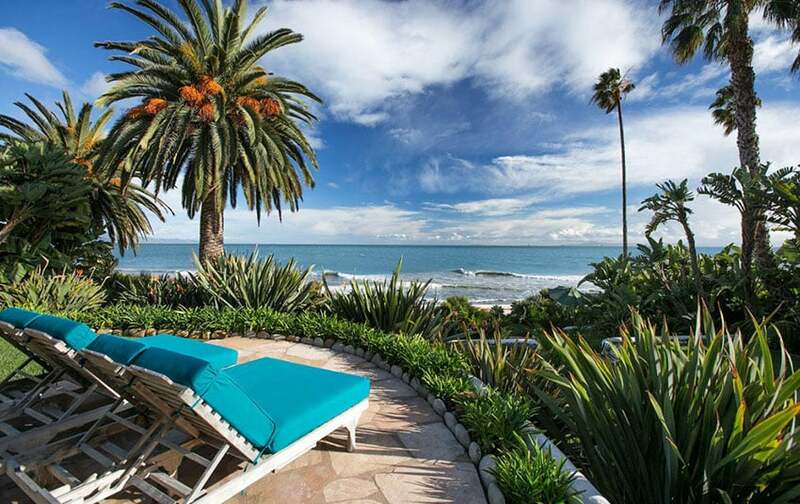 Santa Barbara CA has a great climate that allows one to enjoy the outdoors for most of the year. An aerial view of the home’s backyard with another small stone patio area with an outdoor dining table and furniture. The small flagstone patio is a great vantage point to relax and watch the ocean and listen to the sounds of the waves breaking. Multiple patios and the stunning location make this backyard ideal for both relaxing and entertaining. Curved stucco retaining walls continue the home’s theme throughout the backyard. 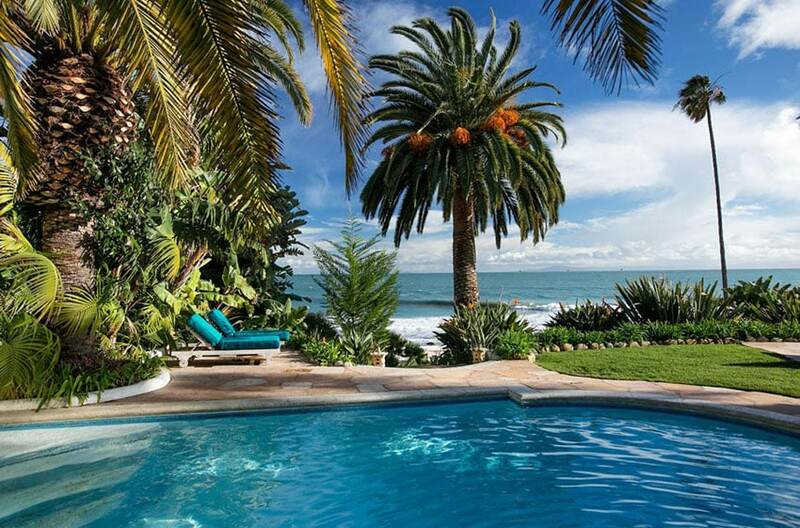 View of the ocean access past a lush tropical garden of birds of paradise and palm trees. 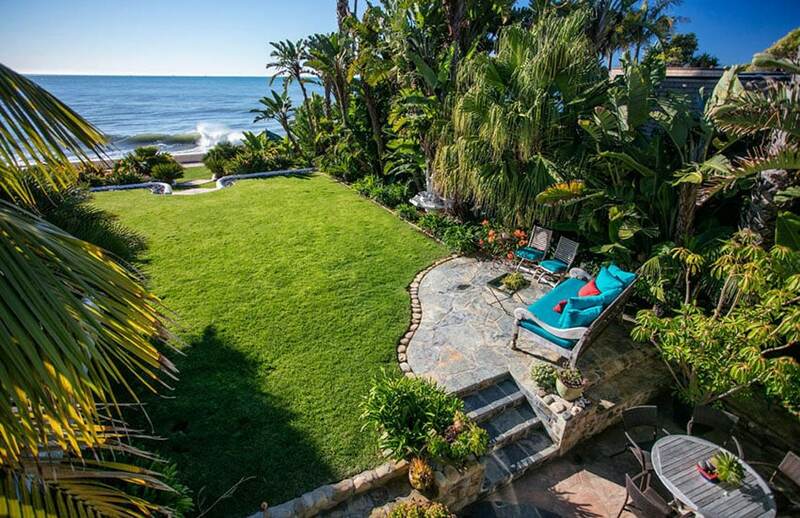 The backyard features sweeping ocean views and plenty of ocean frontage. 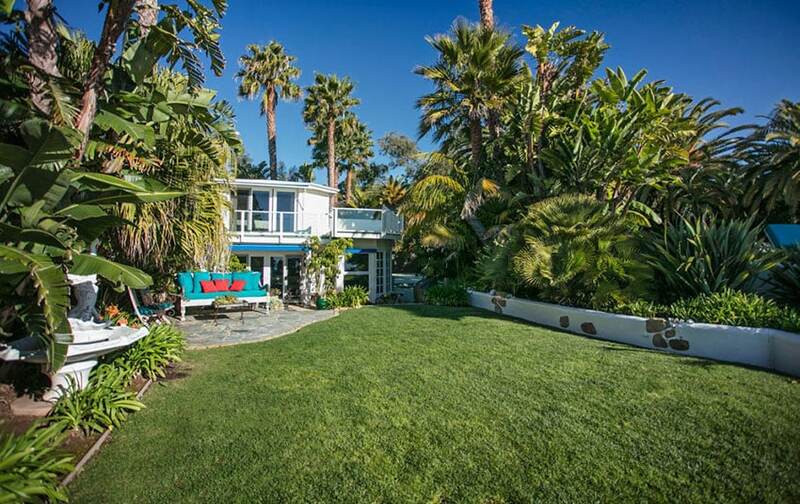 Mature palm trees and smaller tropical plants provides excellent privacy for the beach cottage and the landscaped grounds. A small guest house sits feet from the surf break and offers sliding doors that open to fully appreciate outdoor living. 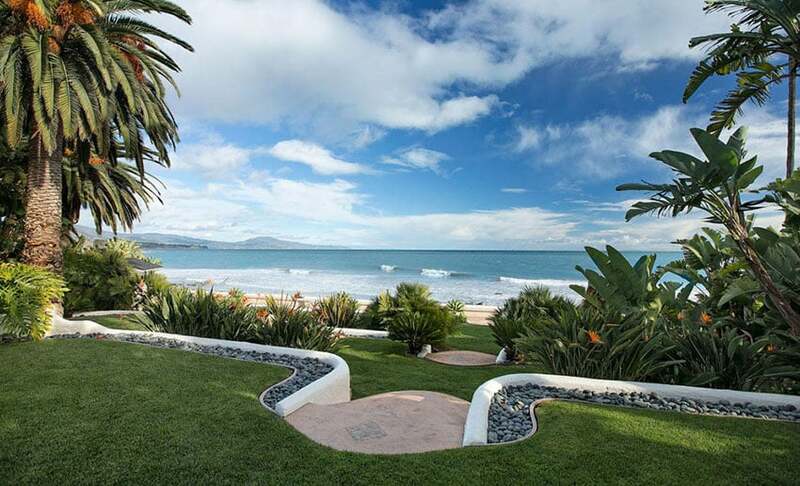 The flagstone pathway leads past a lawn, tropical plants and landscaped river rocks creating a relaxing walkway leading to the beach. The view of the ocean from the guest house with its sandy beach and coastal vista. Relax by the firepit and take in the ocean breezes. This spot is ideal for nighttime entertaining and enjoying the multi-million dollar views. Closeup of the firepit with a patio complete with lounge chairs steps from the water. A true surfer’s paradise with waves breaking steps from the backyard. 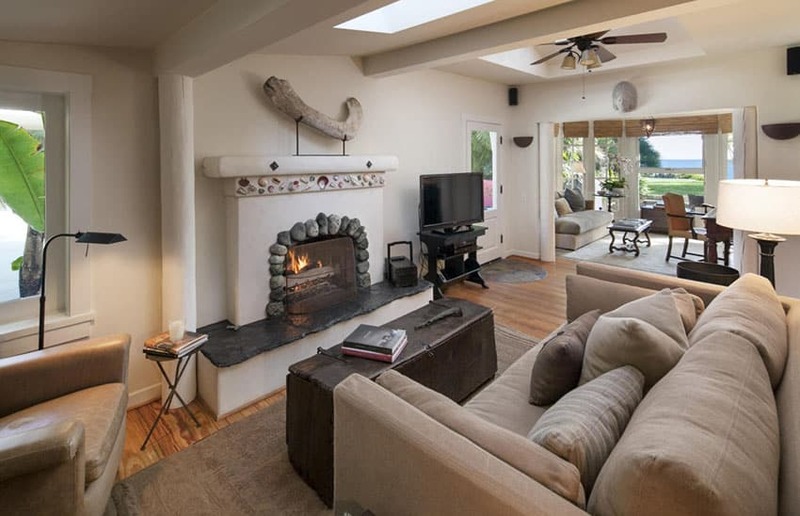 One of the elevated patio areas perfect for taking in the sights of this gorgeous luxury oceanfront cottage in Santa Barbara CA.